Launching marshmallows, flinging marshmallows, catapulting marshmallows! Marshmallows everywhere, but this time we made our catapult out of marshmallows. This easy marshmallow catapult activity is perfect for that stuck inside kind of day or while roasting marshmallows around the campfire. Our popsicle stick catapult and plastic spoon catapult... "Make a mini catapult with your kids out of popsicle sticks and rubber bands, then measure how far the mini marshmallows fly! Great indoor rainy day activity. #science #math" Great indoor rainy day activity. #science #math"
"Make a mini catapult with your kids out of popsicle sticks and rubber bands, then measure how far the mini marshmallows fly! Great indoor rainy day activity. #science #math" Great indoor rainy day activity. 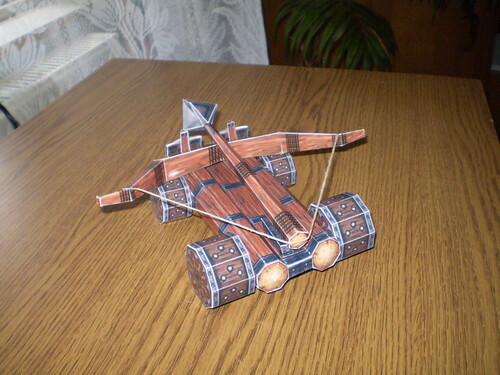 #science #math"
The design for this catapult was modified from the siege catapult in Mini Weapons of Mass Destruction: Build Implements of Spitball Warfare. Popsicle sticks can be glued, taped, or even friction-fit together to create all sorts of cool objects and designs.